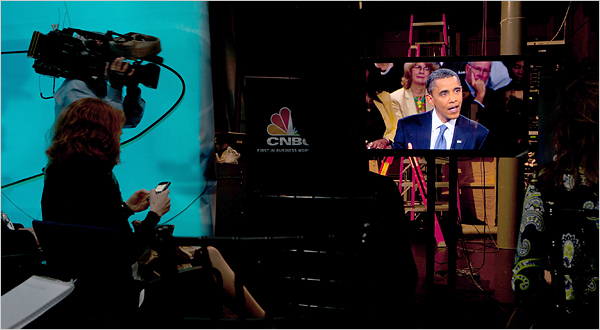 Monday at noon, President Obama sat with John Harwood and a town hall audience for an hour at the Newseum in Washington to discuss the economy live on CNBC. Talk about stretching it out. CNBC took a rolling pin to that hour’s worth of content and spread it out over multiple dayparts. The morning preview/speculation coverage was already well underway at 9:00AM on Squawk on the Street and the screen was adorned with obligatory countdown clock to boot. Leading up to the event, regional focus group viewing panels were asked for their opinions. Pundits pundited. Correspondents corresponded. “What do traders and bankers want to hear?” “It’s live… what if some question comes out of left field, I mean, the market is open! ?” Afterwards, they did it all over again, but this time at least with clips, something to go on. And for twice as long. C’est la media. So, what about the actual town hall? Well, it was pretty candid. On both sides. Definitely from the questioners, arguably from the president. The audience was respectful, if not deferential and admiring, but visibly shaken and frustrated by their collective lot in life. “From 2001 to the I time I took office, your average wages went down 5 percent. We took a record surplus under Bill Clinton and took it to record deficits,” making sure to reference the two unpaid-for sets of tax cuts and two wars. It’s said that this president likes policy, but hates politics. That’s noble, but naive. He is a politician, and has been for decades. And while he may not pay attention to the daily political box scores, millions of Americans do, and that perception snowballs into reality. So, when supporters are openly and vulnerably saying such things, he needs to give them something to grab hold of. Indeed, it felt like he held back, and to his detriment. I wanted him to go a step further, as I felt many of the people there did. Obama was honest, but measured in his optimism. What the country really wants to hear, needs to hear, ironically, is the audacity of hope. And every time he seems on the cusp of saying something sweepingly positive and inspiring, he just stops. “You gotta give ’em hope,” Harvey Milk would say. And hey, economics is in large part based on feeling, on attitude, on psychology, which effects behavior. This notion of the grand pep talk tracks back to another one of my concerns with the Obama team’s messaging strategy. It’s the medium in addition to the message, to throw in some Marshall McLuhan for you theorists out there in Bloggingtonville. Obama’s most powerful rhetorical weapon, against a tepid economy, against Republicans, against Decepticons (don’t kid yourself, they’re here), is the Oval Office address. It simultaneously provides the widest individual reach, the most control, and the most official presentation. So, it’s astonishing that two years into his presidency, he has chosen not to use that unique platform to speak out on the economy, the most important issue facing the country. 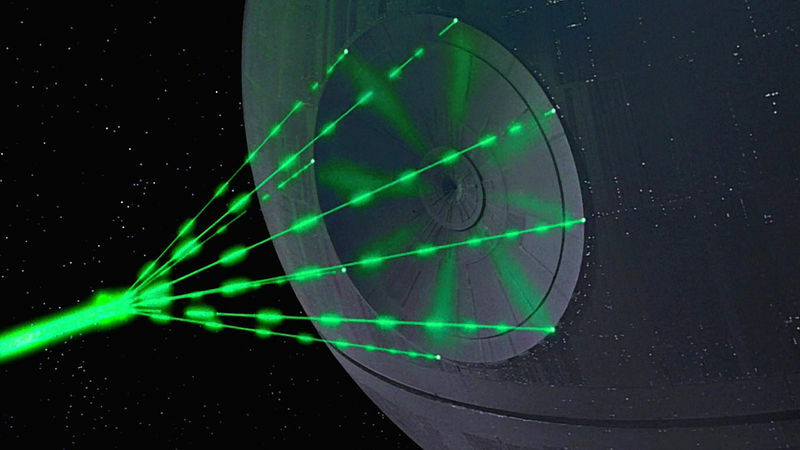 It would be like having a Death Star and not using its superlaser. Don’t get me wrong, the communication options of today are diverse and sophisticated and multiple avenues need to be attended to. But, you don’t see most Fortune 100 companies giving up on all their primetime advertising solely for banner ads, billboards, and tweets. Because, while having a live town hall may be a big deal for CNBC, it’s not that big a deal for America. James Carville hit the first President Bush over the head for his detachment, numbness, and inefficacy in addressing the economy effectively in 1992. 18 years later his message is eerily resonant to a smarter, younger, more engaged man of his own party. Let’s hope the outcome is different. Dear Mr. Wit, Came a cross your piece on President Obama’s recent forum in Washington and was surprised that you made an brilliant and obvious suggestion that I haven’t seen anywhere else. Obama should immediately make an Oval Office address about the economy. Many of us are becoming disillusioned with the Democrats.The Teabaggers have taken over the Republican Party and seem to have no constructive ideas to offer, but only rather irrational and stale ideas. Obama must now talk directly to the public just like FDR did during the Great Depression. Must of middle America has nowhere to go, although I will be attending the Stewart/Colbert rally in Washington at the end of October. Keep up your good work.